37 photos of early steam, industrial steam and trams at the 'Living museum of the North (of England).' It occupies a huge 300 acre site, so big that a tram and bus service runs round it. The museum attempts to recreate life and work in north eastern England in the early 1900s, with a colliery, village and town high street - all created from buildings moved to Beamish from elsewhere. Welcome to Beamish, the living museum of the north [of England]! Mon 8 October 2012. The museum was established on a 300 acre green field site in the 1960s. Everything on the site is new, though often recovered from other locations. 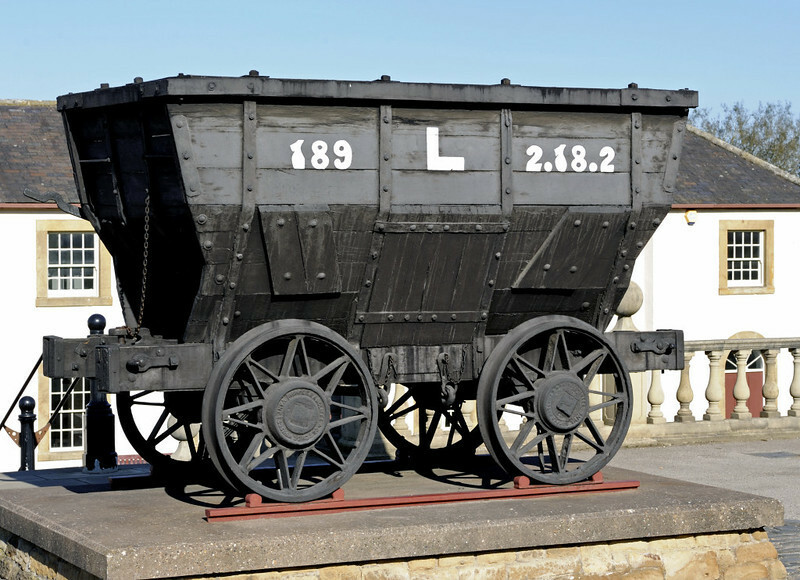 This chauldron coal wagon is the museum's trademark. Actually No 389, it was built in the 1870s for the Londonderry Rly from Seaham to Sunderland. Its carrying capacity was 2 tons, 18 hundredweights (of 112 pounds) and two quarter hundredweights.